A welcoming and quite conveniently located establishment, run by the friendly O’Shea family. We couldn’t be more happy with our stay. A nice breakfast of free range eggs from their own chicks and a comfortable room. Any requests we had were happily accommodated. 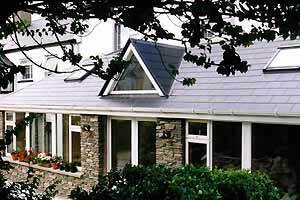 We would recommend highly for your next stay in Caherciveen. O'Sheas was a lovely B&B. We were doing the Ring of Kerry the day we were checking into O'Sheas and didn't end up getting to the B&B until 10 PM. I spoke with Patrick O'Shea a couple times during the day to let him know we would be late at first we thought around 7 pm, but that turned into 10 pm. Patrick was very kind and provided us with perfect directions of how to get to the B&B once we got into Cahersiveen. He even waited up for us to arrive and when he learned we were going to try to catch a boat to Skellig Michael the next morning, he contacted one of the boat captains for us to see if there were any open spots! It's a very short drive from O'Sheas in Cahersiveen to Portmagee where the boats leave for Skellig Michael, if that is something you are wanting to do while in the area. We would stay there again! Friendly People, comfortable accomodation at a reasonable price. And an excellent location. Had a very enjoyable time, very central. Patrick is a great host, friendly, helpful and accommodating. Also the view from my room was wonderful. Thanks! Hospitality was exceptional!!! Very good Irish breakfast ... Great place and location for the money. This wonderfully located B&B provided a fine room and good service. The host family were most cordial and helpful. We would easily stay there again should we be returning to Caherciveen, which is itself a delightful village. Nice Accomodation with friendly staff and a good Irish Breakfast. The Owner of the B&B picked us up a few miles before town, because one of us had an twisted knee. Acts of hospitality like this will always make me coming back to O Sheas. Thanks! It's was very pleasant to stay at O Sheas B&B. Central location in Cahersiveen, spacious room, very firendly owner and good breakfast.